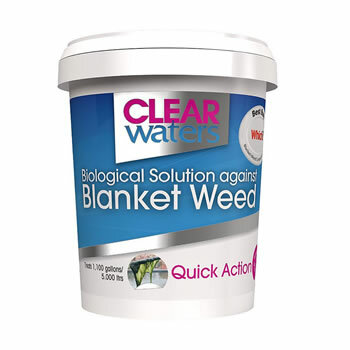 Clear Waters® is an effective treatment for blanket weed in ponds. Clear Waters® contains cultivated beneficial bacteria that clean your pond in a natural way. NO MORE unsightly algae covering your plants or sides of your pond. Clear Waters® is safe for all pond fish, plants and stimulates your biological filtration systems. Use Clear Waters® for a clear and healthy pond for your fish and plants to thrive in. Clear Waters® is all natural, dissolves quickly and your water does not take on a white milky appearance, it does not precipitate on the bottom of your pond. NO NEED to use a sludge remover Clear Waters® contains freeze dried bacteria that decompose sludge and organic waste in a natural way. Follow the dosage for ongoing care and your pond will look better than ever before at all times. Decomposing blanket weed should be removed with a fine net, after this any small amounts left will be decomposed by bacteria and collected in the filter. One tub will treat 10,000 litres/2200 gallons.